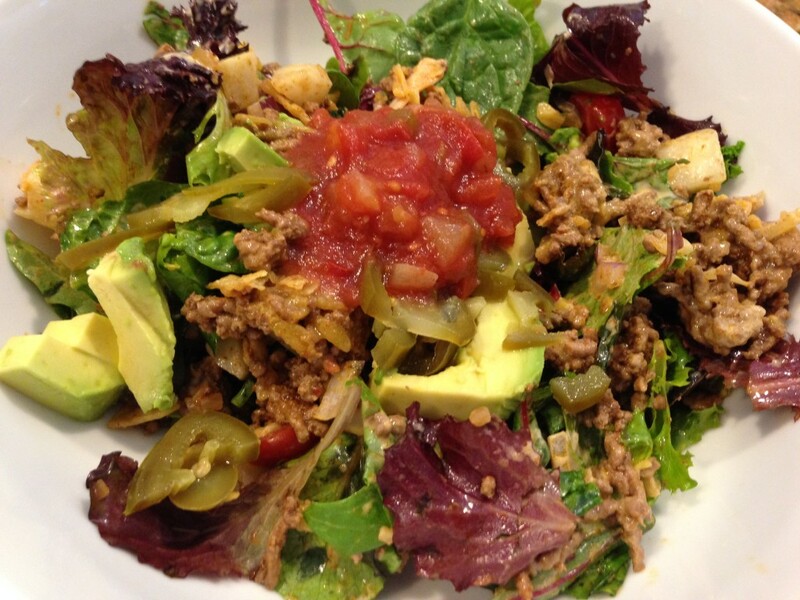 Soup and Salad – Taco Salad that is! It’s no secret that I’m a soup and salad kinda girl. If you follow me on Facebook, Twitter or Pinterest, you’ll see I’m partial to both. Over the years I’ve found soup is a great meal in a bowl. It’s inexpensive but so tasty. I can use quality ingredients and make a good meal for just pennies per serving. Soups are usually better the next day and most freeze really well. Salads are another big favorite of mine. My Mom without a doubt makes the very best salads ever. I’m not sure what she does differently, but her salads are always tasty. They are usually full of fruit, whether that is strawberries, blueberries, mandarins or apples, she always gives them just the right touch. I know when she comes to our home to visit, I could pull the same things out of the frig, but there’s just something about the way Mom puts things together that makes them the best. Salads when we were growing up were mainly iceberg lettuce because that’s really all there was. 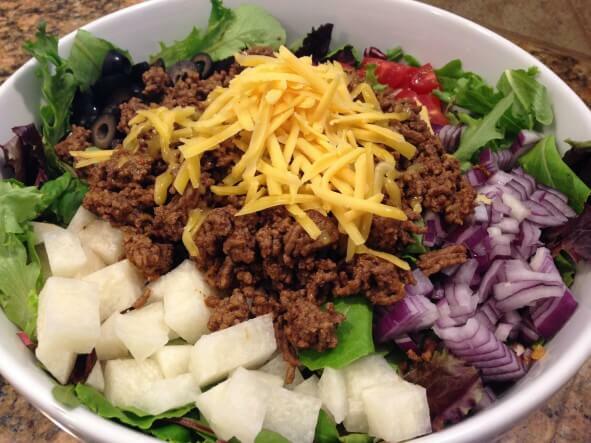 Mom still made the best salads though and today I’d like to share with you her Taco Salad recipe! Pretty simple, she’d start by browning the ground beef and adding a packet of taco seasoning. While the beef was browning she would prepare the lettuce and chop the vegetables. Here I used cherry tomatoes, red onions, jicama an olives. Mom would often add a can of kidney beans too. And on day two…when I still had leftover salad, I added a can to stretch it out a bit! Gotta love a great salad! Right before serving, I added avocado and about 1 1/2 cups of crushed tortilla chips. For dressing – Thousand Island Dressing – about 1/4 cup – this is a really big salad. Then toss the salad really well. I topped it with some store bought salsa and jalapeños. You know it really doesn’t get any easier than this! In 20 minutes dinner was done and it was fantastic! If you’re not a fan of ground beef, use turkey, chicken or tofu – such an easy and delicious meal! When I took my first bite, I remember saying mmmm!!!! This is really good! 😀 Thanks Mom! 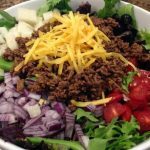 Easy Taco Salad - My Mom makes the very best salads ever. Her Taco Salad is a real favorite of mine and I'm sharing her recipe! Start by browning the ground beef and adding a packet of taco seasoning, as per packet directions. While the beef is browning, prepare the lettuce and chop the vegetables. 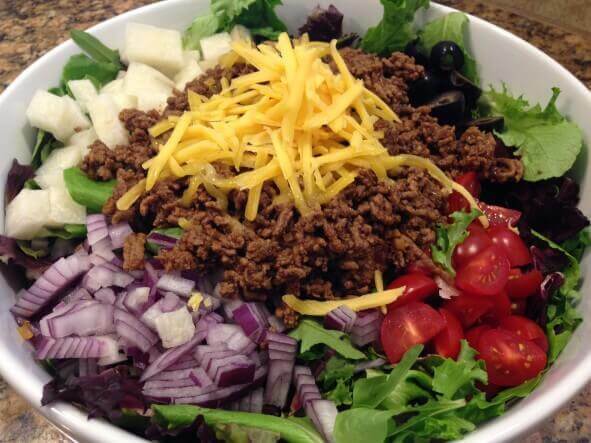 Add the lettuce and vegetables to a large bowl, top with the shredded cheese and taco meat. Right before serving, add the chopped avocado and about 1 1/2 cups of crushed tortilla chips. and enough Thousand Island Salad Dressing to lightly dress the salad. Toss the salad really well. Topped with some store bought salsa and jalapeños. This is just a great salad. Love it. It is! How long has it been since you’re made this salad? It’s always been one of my favorites Mom. I hear you there Michelle! Gotta love a great salad!!! There is nothing like soup and salad. I don’t care what the weather is outside. This is such a wonderful recipe. Yep, soup & salad is great food! Thanks Healing Tomato! This looks fantastic, perfect for the BBQ season! Great Florian, I hope you enjoy it! I love taco salads in the summer. I don’t eat meat but I use cauliflower that I pulse in the food processor until the pieces are the same size as ground meat. Then all you have to do is toss it with the seasoning and saute for a minute or 2. What a great substitute Kathy, thank you so much for sharing! Thanks also for stopping by!! What a yummy family-friendly meal! I love the simplicity…a must for us during our long hot Florida summer! I’d almost as soon have tacos this way. I can get more of my favorite toppings in the bowl! Not much better than a big salad! Right with you there!! I just love the idea of taco salad and soup together. Looks delicious. Soup and salad are always my favorite – thanks Rini! !